After I published 20 Movies About Black History to Stream on Netflix, I found these additional titles to add to the list. The Butler is an American historical drama loosely based on the real life of Eugene Allen, an African-American who is a witness of notable political and social events of the 20th century during his 34-year tenure serving as a White House butler. What Happened Miss Simone? – Using never-before-heard recordings, rare archival footage and her best-known songs, this is the story of legendary singer and activist Nina Simone. The Black Power Mixtape 1967-1975 – Taking a fresh approach to the story of the American Civil Rights Movement, Soundtrack for a Revolution features the powerful music from the movement. Focusing on the freedom songs sung by protesters on picket lines, in mass meetings, in paddy wagons and in jail cells, this film celebrates the vitality of the music and the infectious energy that it provided. Through a Lens Darkly: Black Photographers and the Emergence of a People – The first documentary to explore the American family photo album through the eyes of black photographers, Through a Lens Darkly probes the recesses of American history to discover images that have been suppressed, forgotten and lost. From slavery to the present, these extraordinary images unveil a world confronting the difficult edges of citizenship and what it means to be human. Usain Bolt – Usain St. Leo Bolt is a Jamaican sprinter. Regarded as the fastest person ever timed, he is the first man to hold both the 100 metres and 200 metres world records since fully automatic time measurements became mandatory in 1977. Venus and Serena – Filmmakers Maiken Baird and Michelle Major follow sisters and tennis champions Venus and Serena Williams on and off the courts as both battle health problems and media controversy. Hoop Dreams – Every school day, African-American teenagers William Gates and Arthur Agee travel 90 minutes each way from inner-city Chicago to St. Joseph High School in Westchester, Illinois, a predominately white suburban school well-known for the excellence of its basketball program. Gates and Agee dream of NBA stardom, and with the support of their close-knit families, they battle the social and physical obstacles that stand in their way. This acclaimed documentary was shot over the course of five years. Finding Fela – Finding Fela, directed by Academy Award®-winning director Alex Gibney (Taxi to the Dark Side), tells the remarkable story of Fela Anikulapo Kuti’s life, his music, and his social and political importance. He created a new musical movement, Afrobeat, a combination of jazz, funk, and Nigerian percussion styles. It was also a political force, a propulsive delivery system of Fela’s revolutionary ideas, pitched against the dictatorial Nigerian government of the 1970s and 1980s. His influence helped bring a tilt towards democracy in Nigeria and promoted Pan-Africanist politics to the world. The power and potency of Fela’s music and message endure today, through fans like Paul McCartney and Questlove, and are expressed in the struggle for human rights around the world. American Promise – American Promise is a coming of age story exploring the lives of two African American boys and their families. Their hopes, struggles, achievements and failures are revealed as they make tough decisions to guarantee a better future for their boys. Have you seen any of these? What would you add to this list? 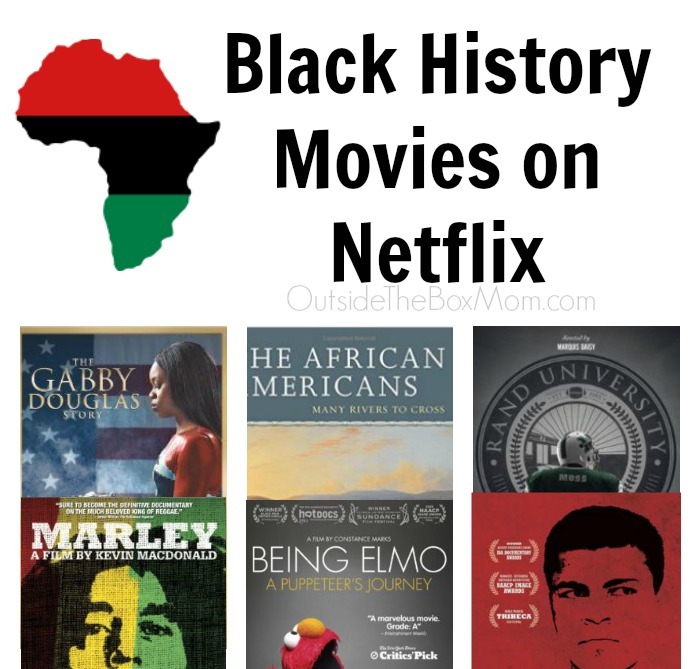 You should also check out my original post 20 Black History Movies on Netflix.